**Shortlisted for the BSA Sociology of Health and Illness Book Prize 2010**What is good care? In this innovative and compelling book, Annemarie Mol argues that good care has little to do with 'patient choice' and, therefore, creating more opportunities for patient choice will not improve health care. Although it is possible to treat people who seek professional help as customers or citizens, Mol argues that this undermines ways of thinking and acting crucial to health care. 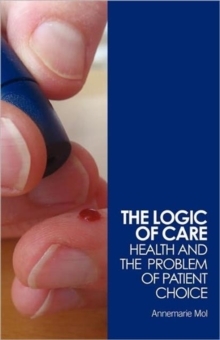 Illustrating the discussion with examples from diabetes clinics and diabetes self care, the book presents the 'logic of care' in a step by step contrast with the 'logic of choice'. She concludes that good care is not a matter of making well argued individual choices but is something that grows out of collaborative and continuing attempts to attune knowledge and technologies to diseased bodies and complex lives. Mol does not criticise the practices she encountered in her field work as messy or ad hoc, but makes explicit what it is that motivates them: an intriguing combination of adaptability and perseverance. The Logic of Care: Health and the problem of patient choice is crucial reading for all those interested in the theory and practice of care, including sociologists, anthropologists and health care professionals. It will also speak to policymakers and become a valuable source of inspiration for patient activists.